Well, I’m principally a science-fiction or fantasy writer. 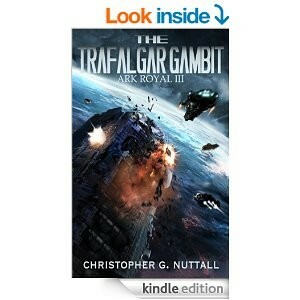 My writings range from ground-based action (The Empire’s Corps), fleet action (Ark Royal) and light fantasy stories. I’m quite interested in how societies cope with sudden changes so that shows up quite a bit in my works. For example, I’ve got one trilogy set during an alien invasion (with another on the way), several sets of book set within decaying empires and one set in a high-tech universe where they come face to face with something inexplicable. I’ve also written a couple of political/military thrillers and an attempt as a humorous cross-time travel story. How easy or hard has it been to get visibility and build a name in science fiction? Very hard. I’ve been writing for around six years before I started putting work on Kindle, then The Empire’s Corps broke through two years ago. There’s an astonishing amount of self-published books on Kindle, so writers have to work hard to be noticed. I’ve been giving away free samples (roughly ¼ of a book) on my site, which helps people make up their minds about reading the book or not. Generally, if you like an author, like their page. It’s great for them. I tried a pay-for-promotion offer once (it looked very tempting.) I’m not sure if it was worth it or not. Ask people to review? <grin>. I’ve been offering free books in exchange for reviews, but I haven’t had very many takers. I think a good book or a bad one will draw reviews. I think I would have liked to know about which books would be successful sooner <grin>. I’ve picked up a number of voluntary editors and cover designers over the years, all of whom I wish I’d known sooner too. I think I knew it before I started, but you get major credit for not incorporating any form of DRM in your books. It’s a pointless and futile attempt to prevent piracy, which is a tiny threat, and annoys the hell out of readers. I sometimes wish Kindle was more flexible with regard to file types, but with some effort any of my files can be converted into something else. Free books on my site? I feel it helps build goodwill among readers, if nothing else. I do run promotions from time to time, where I offer a book for free – watch my mailing list come Christmas, if you’re interested. Don’t give up, basically. It takes time and effort to drum up sales at first. More specifically? Get a decent cover, a reasonable copy edit, and put it at a reasonable price. Don’t use free promotions unless you have something else to sell (as it builds up interest for nothing). Price your books reasonably (unreasonably high prices lead to bad reviews). And keep plugging away. I tend to start with blog announcements and suchlike. Sometimes, I offer free books as part of the deal. For example, when I launched The Slightest Hope of Victory, I offered a free copy of Outside Context Problem to new readers. Do you have any advice for finding success with the new Kindle Unlimited program? I don’t know enough about Kindle Unlimited, as yet, to comment. In all honesty, I’m not a big fan of the idea as presented to me, because it doesn’t reward authors as well as a direct purchase from Amazon Kindle. (If you want to reward your authors, purchase a book directly instead of through Unlimited or KOLL.) However, some of my books are in the KU program and I will monitor results over the next few months. Ask me again afterwards. I have at least five or six more books planned for The Empire’s Corps universe, which has eight books already (and one currently underway). I’m not intending to bring the storyline to an end so quickly, but it should at least conclude the mainstream storyline. There will also be glimpses into Colonel Stalker’s past, as well as several other spin-off books. I intend to write a second series based on the Ark Royal universe, featuring a new ship and commanding officer in the years following the end of the First Interstellar War. That should be coming in September, perhaps earlier. I also have plans for a fantasy series – two of them, in fact. All of these – and more – will be announced on my blog.